The Swiss company Alprockz AG announced the development of a new financial and technical tool, powered by the Ethereum blockchain-based platform to provide financial services by issuing ROCKZ stable coin. The Alprockz platform will allow users to benefit from a stable coin used for fast and economic monetary transfer around the world. Among the key features will be the conversion of cryptocurrency into a reliable & stable fund in real time, along with opening up limitless opportunities for market makers to switch to a new base currency. ROCKZ (RKZ) is the stablecoin, backed by a national currency the Swiss franc (CHF), which will be issued at a ratio of 1:1. At the same time, the company-issuer ROCKZ AG will store 90% of its reserve funds in CHF banknotes in high-security Swiss bank storages. Another 10% will be placed in storage in various Swiss banks to ensure coin’s liquidity. This will give to the issuer credibility, and when it comes to Rockz holders — confidence that the digital asset is backed by fiat money. 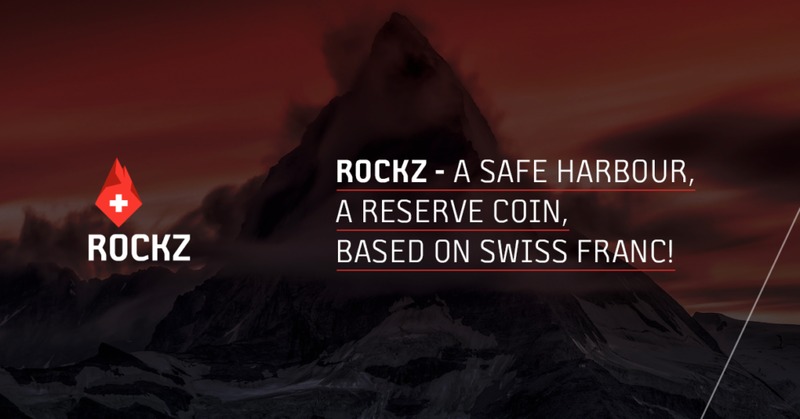 ROCKZ сryptocurrency is fully backed by Swiss franc and is compliant with national and international legislation following the cryptocurrency regulation. Alprockz AG is registered in Zug, owned by Swiss investors, and is audited. Monitoring and confirmation of the fiat-backed concept of ROCKZ will be carried out monthly with the publication of a report. A list of financial intermediaries and bank vaults providing stability to Rockz is available at any time. E-commerce: ROCKZ can be a convenient method of payment, along with payment services like PayPal and Webmoney in view of the stability of the underlying asset and low commissions within the network. Investments: ROCKZ can be a store of value asset. Money transfers: ROCKZ can become a reliable tool to facilitate cross-border transfers in view of low commissions and low volatility in the market of $ 65.7 billion (excluding corporate transfers). Banking: Based on ROCKZ, you can create a large number of financial instruments: loans between platform users, bank deposits, etc. ROCKZ stable coin backed by Swiss Franc — the most stable currency in the world should become a more attractive financial tool than its competitors — Tether, TrueUSD or Dai, all backed by the US dollar. What are your thoughts about the Alprockz partnership? Let us know in the comments below! Images courtesy of Alprockz, Shutterstock.